Gary Barber’s War of Will soared to the top of the Road to the Kentucky Derby leaderboard by taking the $400,000 Risen Star Stakes (G2) at Fair Grounds February 16. The first race of the "Championship Series," the Risen Star was worth 50 points to the winner, and War of Will increased his total to 60. The Mark Casse trainee was coming off an impressive, four-length tally in the $200,000 Lecomte Stakes (G3) at the same track, where he picked up his first 10 points toward the Derby. That also marked his first stakes win. 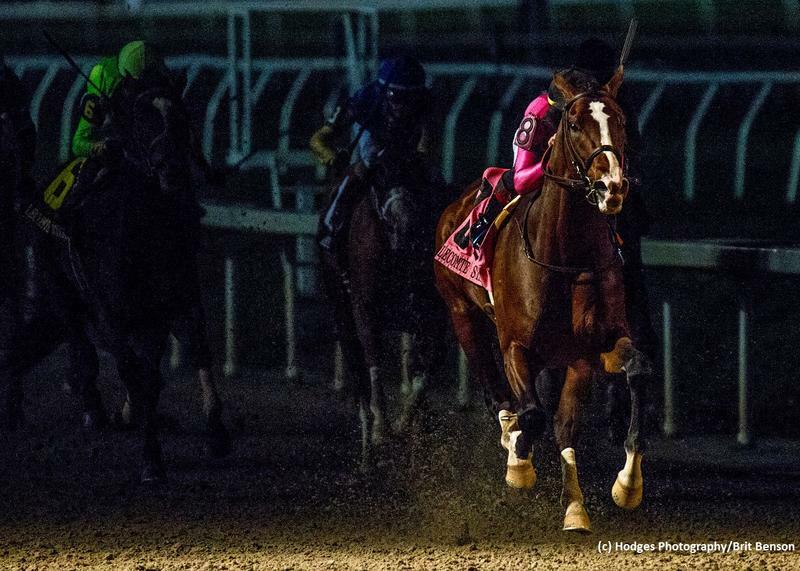 War of Will again looked like the real deal when dominating the Risen Star. Breaking from post 13 with regular rider Tyler Gaffalione, the even-money favorite endured a wide trip chasing the pace, but easily took over on the far turn and drew off by 2 1/4 lengths. As Casse stated about his talented colt, "I have just the utmost respect for this horse. I think he has the potential to be an absolute superstar." The bay began his career in August and finished third in a maiden special weight contest on the Woodbine turf course. War of Will came right back to finish a close second in the Summer Stakes (G1) on the same lawn, and he ran a pair of good grass races following that. The Kentucky-bred was just a length back when fourth in the Bourbon Stakes (G3) at Keeneland, which preceded a fifth-place performance in the Breeders’ Cup Juvenile Turf (G1) at Churchill Downs. War of Will made his dirt debut in November at Churchill Downs in an off-the-turf special weight event and he turned heads with a powerful, five-length romp. He is now three-for-three on dirt and his future on the surface looks very bright. The winner earned a new career high 96 BRIS Speed figure for his Risen Star score, improving on his 94 from the Lecomte. In his first two main-track races, he posted triple-digit BRIS Late Pace numbers (103, 106) . War of Will is bred for greatness, too. He is by top sire War Front, who is responsible for at least 79 stakes winners and eight champions. Though War Front was a dirt specialist who never raced on the green, the top progeny of the Grade-2 winning son of Danzig have mainly been turf standouts, both here and abroad. Listed heroine Visions of Clarity is the first dam of War of Will and the versatile Irish-bred mare has produced a pair of stakes runners in addition to the colt. Pathfork was a Group 1 winner as a juvenile on the turf, while Tacticus was a dual stakes winner going marathon distances on the dirt in 2015 for conditioner Graham Motion. Visions of Clarity counts herself as a half-sister to the sensational Spinning World, who concluded his brilliant career with three Grade/Group 1 wins in succession, capped by a superb victory in the 1997 Breeders’ Cup Mile (G1). This is a family that goes back generations with top-class performers throughout. To date on the dirt, War of Will has shown a high cruising speed as well as push-button acceleration. The top three-year-old prospect is from a long line of greatness and appears to be following right in their hoofsteps. He is out of a Sadler’s Wells mare and has a half-brother who excelled at running up to 1 5/8-miles on the main oval, so I can’t envision War of Will having any distance limitations. And judging by his last three performances, it’s hard to argue that statement.